Director Elijah Moshinsky’s production sets Verdi’s poignant opera in colonial Boston, where Riccardo (Luciano Pavarotti) is the British governor, in love with his best friend’s wife. 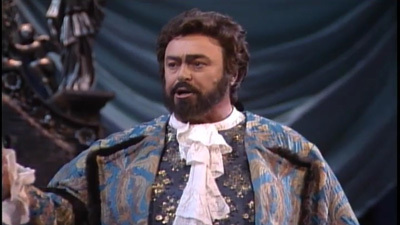 “Perhaps the most complete role for a tenor…a severe test, both vocally and dramatically,” is how Pavarotti described his role. Of course, he’s brilliant—with his distinctive plangent and ringing voice going straight to the heart of the role and to the hearts of the audience. A gorgeous Katia Ricciarelli is the woman he loves and Louis Quilico is her unforgiving husband.